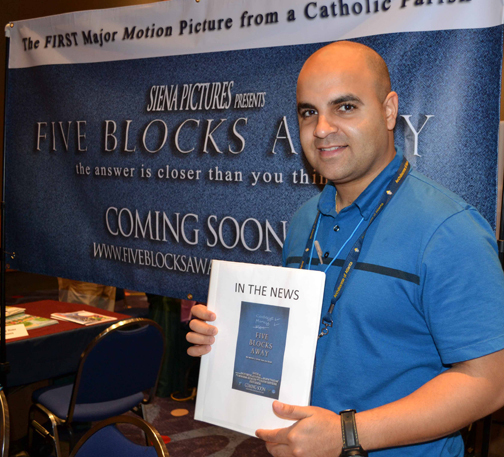 Kevis Antonio, writer/producer/director of Five Blocks Away, passionately promotes the independent film project at the Eucharistic Congress held June 9, 2012 in Atlanta, GA. Writer, director and producer Kevis Antonio has worked on numerous films and is founder of Rising Faith Productions. His documentary, Bread of Life, received rave reviews, was officially selected into the John Paul II International Film Festival and was syndicated on an international TV network. Kevis’ current movie project, Five Blocks Away, is his first feature film. Listen to Kevis’s Art as Worship interview on Empower Radio. A member of St. Catherine of Siena Church, Kevis serves on the leadership team of Siena Pictures. Kevis’ twin passions are film and faith, and through his work in the film industry, he is able to combine the two for the benefit of those who wish to learn more about the word and will of God. Kevis and his wife Stacy reside in Acworth with their newly born twin boys. 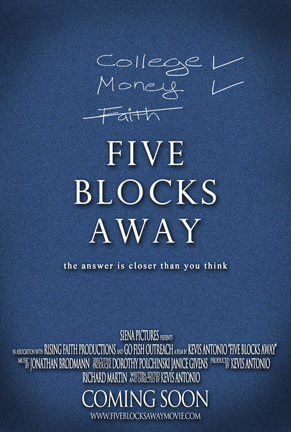 Find out more about Kevis and the feature film project Five Blocks Away at www.fiveblocksawaymovie.com. Like the film page on Facebook for updates on the project. Check out the article about this project in the Marietta Daily Journal. David Greer: What Will You Do for the First Time This Year? David Greer, entrepreneur, songwriter and filmmaker, looks back at the end of a year and says “What did I do last year for the first time ever?” In this interview David shares examples of pursuing new venues of creative expression by giving himself permission to NOT be perfect. Listen to David’s Art as Worship interview on Empower Radio. In the world of business, from marketing to publishing, and now in music and film, David Greer believes it all starts with a story. For more than 30 years, David has harnessed the creative tools of the day to tell the stories of clients and causes – in print, online, through images, video, film and song. His use of creative messages to achieve concrete business goals has garnered him a stellar reputation in marketing and media, while newer endeavors in the music and film industries have brought those mediums to the art and craft of his storytelling. Extending his work into new mediums, David recently ventured into the world of filmmaking. David’s first screenplay was a quarterfinalist in the 2007 Slamdance Screenplay Competition, chosen from more than 2,200 screenplays. David’s first short film, produced and shot on location, was accepted into the International Family Film Festival in Hollywood, California. 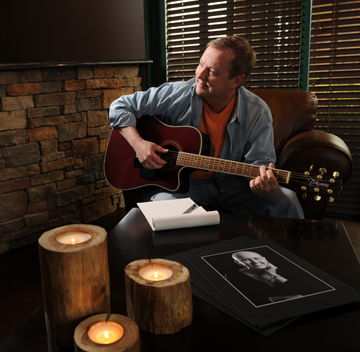 He’s written songs like We Light A Candle and All Are Our Heroes, to benefit all those touched by cancer. The song and social media campaign became a touchpoint and a sustainable campaign to raise awareness and funds for the Cancer related charities. Recently the Heroes Project has morphed in to a new endeavor called Faith On. Greer says seeing cancer survivors incredible faith inspired him to explore the role faith plays in every day life. Anybody can face a hardship… be it unemployment, rebuilding after a hurricane, heartbreak, illness and many other hardships. Greer seeks to use storytelling and real world examples to inspire folks to press on in faith. So far the campaign has reached 20 countries and throughout the US and a new song is in the production stages along with a Faith On Magazine and social media sites. A benefit concert is planned for 2012. 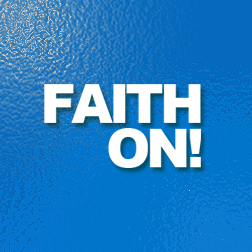 Find out more about the project at www.FaithOn.com or “like” the FaithOn Facebook page for daily encouragement. An entrepreneur at heart, David launched his own marketing and media company in 1996, Tillman Allen Greer, enabling him to combine his technical knowledge with problem solving and creative applications in the marketing arena. A believer in vision with a keen focus on a quality outcome, David is known for balancing practical business sense with creative endeavors. Tillman Allen Greer has provided strategic marketing services, including economic development, business development, public relations, advertising and creative design, video production, Web site development and collateral production to key organizations in the metro Atlanta area and throughout the state for more than a decade. The firm has produced award-winning work for Gwinnett Technical College, Gwinnett County Public Schools, the Gwinnett Chamber of Commerce, Discover Point Child Development Centers, the Gwinnett Center and the The Brand Banking Company. David is the creator of the now famous Gwinnett County development campaign Success Lives Here. In the media realm, David has launched several award-winning publications. He is the founder and publisher of both Gwinnett Magazine, the area’s definitive lifestyle and business publication, and the Gwinnett Business Journal. Listen each Wednesday at 9am Eastern on Empower Radio to hear another artist’s story. Recommend an artist for us to interview or share your comments below or on the Art as Worship Facebook page. Namaste!